If we’ve written a million blogs on this subject, we’ll write a million more. That’s how important learning how to recruit and retain fathers in your program really is. The good news is that we never get tired of discussing it and sharing ideas to help you succeed. So much so, that we recently posted a brand-new web page on fatherhood.org dedicated to just this! And the best part is that you can download a PDF copy of the page to share with others and refer back to. Getting and keeping fathers interested in your program is the exact title of this new content from NFI. This expert advice collected from years of experience working with partners like you, and other groups who have done research and collected ideas for succeeding at it, now officially lives on a fancy web page at: https://www.fatherhood.org/keeping-fathers-interested-in-fatherhood-program. You can jump over there to start reading now, or you can hang with me for a few more minutes to learn more about the resource and why it is so valuable. Recruiting fathers is BAR NONE, the most talked about subject in our work with NFI partners who serve fathers. The second most discussed subject is keeping the dads interested and getting them to come back. As many of you know, it is not a “build it and they will come” scenario. It takes thought, planning, and diligence to find the dads in your community to serve and get them hooked. In the past, we’ve discussed ways to create that “hook” to get fathers in the doors. We’ve also discussed overcoming common challenges to recruiting dads into your fatherhood program. 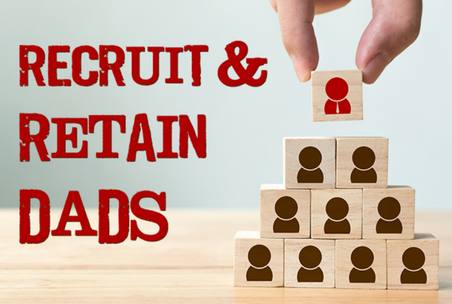 But never before have we put EVERYTHING we’ve collected and learned over the years about recruitment and retention into one place. Let me break down these sections for more perspective. This section focuses on tried and true, “boots on the ground” ideas and suggestions for where to find dads and recruit them into your program. The list is huge! Some of them may be familiar to you, but I can guarantee there are many you’ve never thought of. Check it out and try a couple in the coming months. There are a number of factors that play into why a dad may come to your program and not return (or, not return on a regular basis). We address many of those factors in this section such as transportation issues, location, personal contact with fathers, group rules, leadership, and more. These tips come from years of best practices from organizations like yours who have found ways to keep dads coming back. Community connection is extremely important to your success. Don’t think being a sole house on the top of a mountain will get you where you want to go. You are likely located within a community – whether it be small or large, close or far apart in distance – and you will benefit from connecting with others and leveraging their support. These sections give tips and ideas for doing just that. At NFI, we are always trying new innovative things, especially ones that are research-backed. In this section, you will learn about innovative ways to recruit and retain dads in your program. These are more than “out of the box” thinking. They are simple yet powerful social science and behavioral research-backed methods that you really should use. As soon as you do, it will be like second nature and you won’t know what you did without them! Download the PDF copy and print or save it. Pick 2 things to try in the next 2 weeks with the dads you serve. If they work, keep doing them! If they don’t, well, pick two more. And maybe, just maybe, before we know it, recruitment and retention of dads won’t be such a hot subject because you will all be doing so awesome at it.